Ortega y Gasset Projects is pleased to announce Cary Hulbert’s The Prophet in The Skirt, our dedicated space for site-specific installations. The Prophet will run concurrently with Lauren Whearty’s curatorial debut at OyG, Frame Work, and will remain on view through September 2017. Cary Hulbert’s The Prophet envisions scenarios of societal collapse and environmental ruin, inciting critical reflection on current predicaments by forewarning us of the impending pitfalls of our unending techno-acceleration. Privately participating through a single pair of headphones, each listener is confronted with what seems to be a personalized fortune gone awry, as The Prophet responds anytime anyone presses the button on the installation’s outer reflective surface by randomly reciting what is actually one of twenty-five generic narratives of the future. Each narrative presents a foreseeable trajectory for the human population, but the tone varies from somber to mischievous throughout the series. 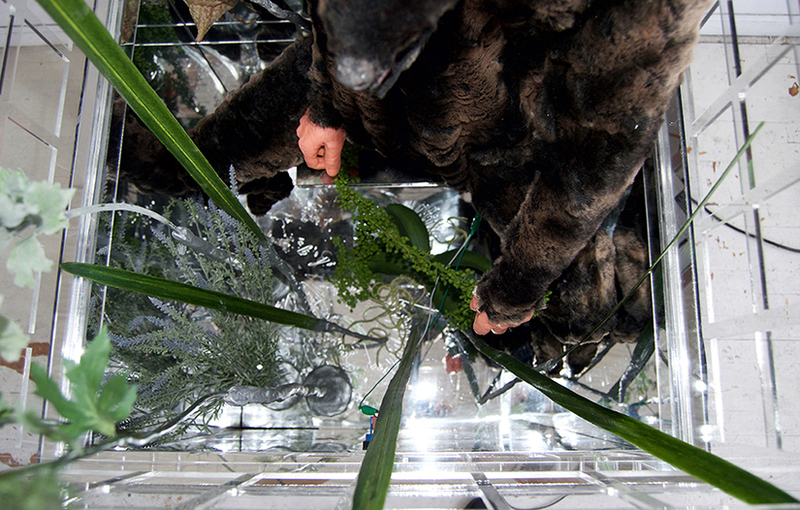 Seated upright inside a translucent enclosure, The Prophet consists of accumulated materials—laser-cut plexiglass, molded silicone, synthetic fur—which allude to a point in the future when the boundary between the natural and the artificial is no longer apparent. The blue LED’s, reflective surfaces, and unfamiliar rock formations also indicate the clairvoyant automaton probably arrived on Earth via backwards time-travel, risking the extra-dimensional voyage because the foreseeable threats are so daunting. Cary Hulbert is a visual artist primarily working in installation and print. She has exhibited her artwork both nationally and internationally, including shows at The Jewish Museum (NYC), The Pfizer building (NYC) Fisher Landau Center (NYC), Liu Haisu Art Museum (Shanghai), IPCNY (NYC), and Taimiao Art Gallery (Beijing). Hulbert earned her BFA from Montserrat College of Art, and her MFA from Columbia University. She lives and works in Brooklyn, NY.